Super moist banana bread swirled with Nutella and macadamia nuts. 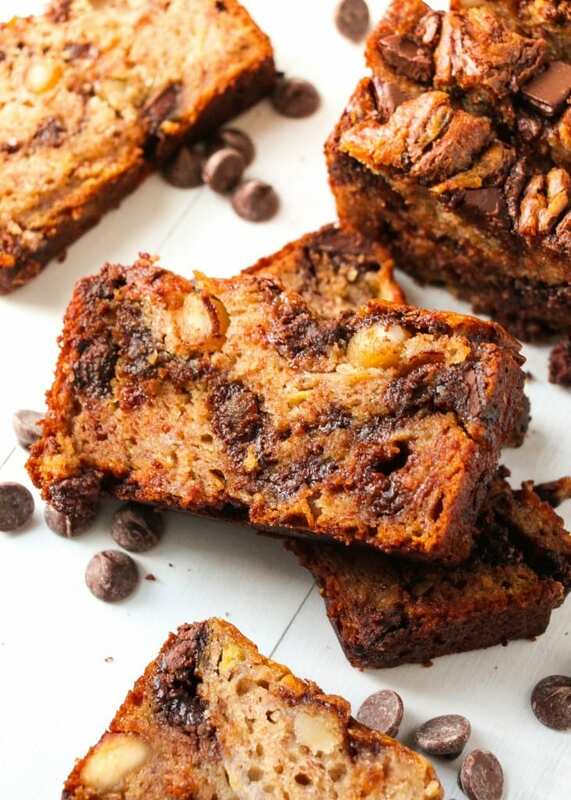 This nutella banana bread will seriously melt in your mouth! 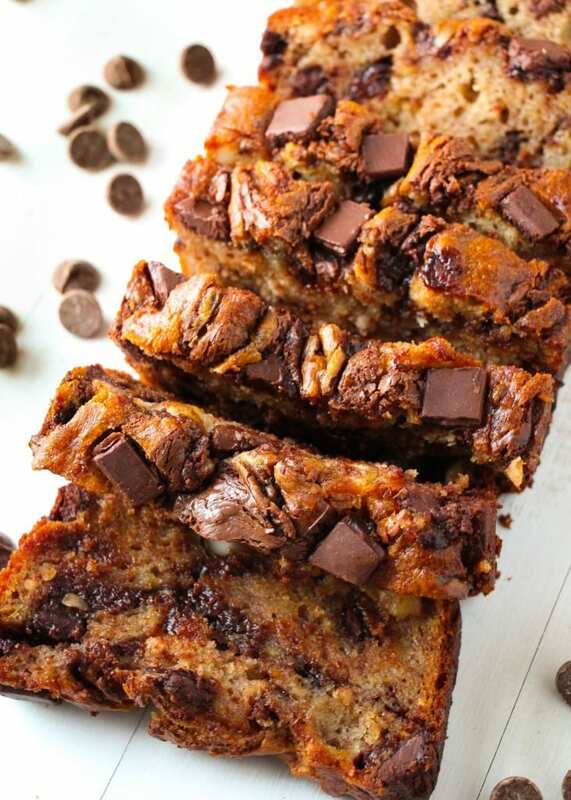 This nutella banana bread recipe is sure to be a hit in your family! 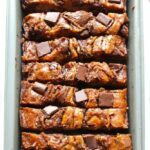 After trying this version, be sure to try this cinnamon swirl banana bread, zucchini bread, or this healthy banana bread. My inspiration for the recipe came from a favorite vacation snack. Our favorite vacation destination is Hawaii (more specifically, Maui) and in Maui they sell two foods at the grocery stores that we get every time we go – Maui onion kettle chips (think sour cream and onion but 100x better) and milk chocolate covered macadamia nuts. Those two foods are some of my favorite foods on the planet. This combo of banana bread came to me as I was looking out at the bone-chilling cold weather, dreaming of the warm sunny beaches of Hawaii, standing next to a couple of leftover (over-ripe) bananas sitting on the counter. In that moment, I figured the closest I would be able to get to Hawaii was to bring the flavors of Hawaii to my house. Behold: Nutella Swirled Macadamia Nut Banana Bread. And let me tell you, with one of bite of this nutella banana bread, I went to heaven and Hawaii and back. It’s made like other normal banana breads with a couple of additions: A generous swirl of Nutella, macadamia nuts, and chocolate chips. This banana nutella bread is simple to make and will be a hit with whoever tries it! Perfect for on the go breakfasts. Is your mouth totally watering yet?!? Because I can hardly control myself looking at these pictures and I only have ONE SLICE left! Must.Make.More. Tip: My favorite way to slice banana bread is in slices (like normal) and then cut each slice into thirds… It makes perfectly portioned slices AND 3 pieces of banana bread is sooo much better than 1, right?! Preheat the oven to 350F degrees. Lightly spray a 9x5 loaf pan with nonstick spray. Set aside. Make the bread: In a medium bowl, mash bananas. Whisk in applesauce, egg, egg white, and vanilla. Set aside. In a large bowl, toss the flour, baking soda, salt, and cinnamon together until combined. Using a large spoon or rubber spatula, slowly mix the wet ingredients into the dry ingredients. Slowly stir in oil until everything is evenly mixed together and no more flour pockets remain. Do not over-mix. Fold in the macadamia nuts and chocolate chunks. Spoon the batter into the prepared baking pan. Drop 3 tablespoons of Nutella on top of bread in a row. Swirl with a knife. Bake for 60-65 minutes, loosely cover/tent the bread with aluminum foil after 30 minutes. This will prevent the top and sides from getting too brown. The bread is done when a toothpick inserted in the center of the loaf comes out clean. Remove from the oven and allow the bread to cool completely in the pan on a wire rack. Slice and serve. This bread is mind-blowing, Chelsea! Nutella is pretty much the best thing ever, so the combination of macadamia nuts and banana bread seems perfect! Love this! And pinned! This may be the most awesome banana bread I’ve ever seen! I hardly bake with macadamia nuts so I can’t wait to try this! Oh my goodness! Nutella AND macadamia nuts..IN BANANA BREAD? Pretty sure you just took my dreams and baked them right into reality. I am obsessed. pinned! This bread sounds and looks fantastic! I’m all about Nutella swirled into anything. 🙂 Pairing it with macadamia nut banana bread sounds wonderful! Oh wow, this bread looks seriously, DANGEROUSLY delicious! Macadamia nuts are pretty much my favorite thing ever, followed closely by Nutella, so this is definitely going on my recipe to-do list. Thanks for sharing the recipe! I’ve gotten so into banana bread lately and this one looks fantastic! Hope you all had a great weekend! This looks heavenly. I need to try these ASAP. Oh my lanta this bread looks illegal! I love those swirls but the kicker is those macadamia nuts. They’re so rich and creamy! This would be my kryptonite – fantastic recipe! Love macadamia nuts! Need to try this bread asap! Pinned! I think I just put on like 5 pounds looking at those pictures. Talk about delicious-looking! Pinning for sure. This is by far my all time favourite banana bread recipe. Everyone who has tried it loved it & I get lots of praises! It’s my go to, every time! Tks Chelsea! ?